The ‘Wonder Woman’ Costume This Woman Re-created With A Cheap Yoga Mat Will Shock You. Since the very first look of the movie, “Wonder Woman”, people haven’t been able to forget the character. Wonder woman is a ‘superhero’ or should I say ‘super-heroine’ movie, released in 2017. The story is based on the DC Comics representing the same character. She has been on the minds of everyone, not just because how gorgeous she looks, but also as the symbol of feminism Wonder Woman stands for and the female empowerment and strength the movie showed. Gal Gadot who plays the character who was praised by everyone and has earned for herself a huge number of fans. She is not only an idol for young girls but also girls want to be like her. So many inspired fans and makeup artists have recreated her makeup look and also tried to recreate her costume in their own way. One of them is Rhylee Passfield from Australia. She is multi-talented. She is an actor, model musician, makeup artist, and stylist. You will be amazed to know that she recreated this look in 50 hours with just $30. 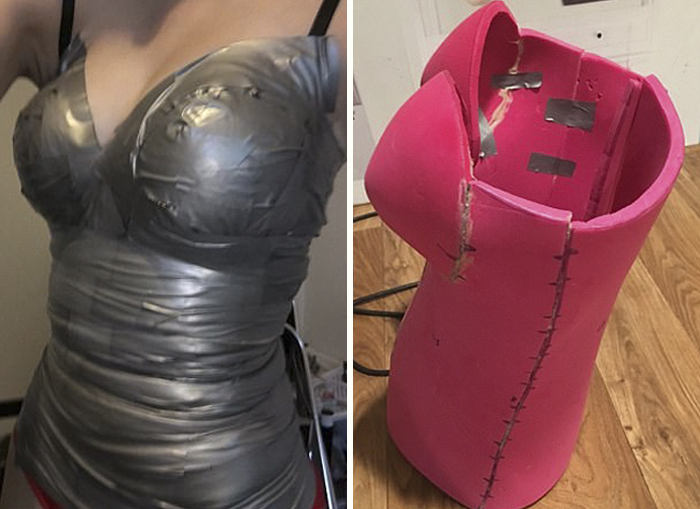 She just used a yoga mat, duct tape, and glue from the hot gun. Previous articleGenius Artist Transforms Random Things On Street Into Unbelievable Art.